One thing that is sitting at the back of my brain until the time comes, is the want to attend Major League Baseball's spring training. For those of you who know me, I am a die hard Toronto Blue Jays fan; One year I will make my own dream come true, cross one off the bucket list, and spend a week in Dunedin, Florida and watch my favourite sports team play in sunny spring training baseball. But aside from myself, and other fans, it really is all about the boys on the playing ground. That's what the fans are there to see anyway. One thing I tend to hear when it comes to spring training, and I am guilty of this as well, is that nothing matters at this point in baseball season and it is "Just spring training". This has proven true, as I'll use my team as an example, the Blue Jays have held middle to lead of the pack winning percentages during spring training. In 2012 the Blue Jays finished with a record of 24-7, with a 0.774 winning percentage, which topped the majors by a whopping 6 game win advantage over the next team. That regular season, the Blue Jays went on to finish a disgusting 20 games back of a playoff spot. This did have a lot to do with the loss of star player Jose Bautista who has been unfortunately plagued by injury over the past two seasons... I digress. On a side note, Kansas City Royals third baseman Mike Moustakas has a career batting average of .244%, but in the 2014 spring training season through 15 games, he is batting .468%, almost double his career average. Just goes to show what can be done in these meaningless games. Now take into considerations the players fighting for their life to make it onto the team, these games mean absolutely everything to these men. To guys like mentioned Jose Bautista spring training is a cake walk, and this year he earned himself a home run on his first at bat of spring. But for Marcus Stroman, a twenty-two year old right handed pitcher for the Blue Jays has a block on his shoulders every time he heads to the mound. Marcus Stroman spent his minor league career in single A baseball, playing for the affiliated Vancouver Canadians. Approximately half way through the Canadians season, he was promoted to AA New Hampshire to play 15 more games earning 3-0 record and 23 strikeouts. This is the second year Stroman is hitting the mound for the team in spring, but last year he failed to land a roster spot. He unfortunately ran into some trouble when he got tagged with a 50 game suspension due to substance inhalation. He took a stimulant that was found in an over the counter supplement that was illegal against the Major League's drug program. Unknowingly, but accepting, Stroman took the suspension and looked to use it towards his advantage. As mentioned, all star players enter spring just trying to tune up their game, including pitchers. Blue Jays starting pitching was bolstered last year in some major off season deals and pick ups, which now fills three out of the five available spots in the rotation. Stroman is just one of five men battling for the two remaining spots so he lays his heart and soul on the line every opportunity he can get. Stroman is still young, and he has a lot to learn as he admitted saying this in an interview with a writer from Minor League Baseball "I've been developing for a few years. Learning how to get hitters out. 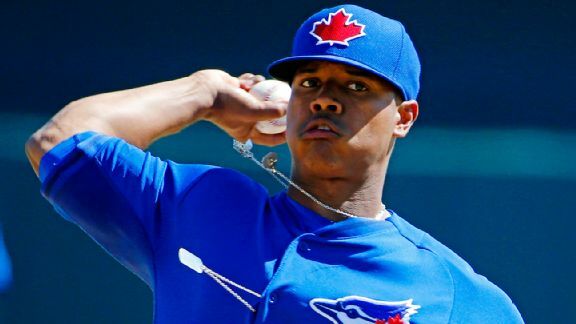 Becoming more of a pitcher, not just go out there and try and strike people out but learn how to set people up and hit my spots"
2014 is going to be a very interesting year for the Toronto Blie Jays as it will be a transitioning year, which holds true for Stroman as well. As for the true meaning for spring training, it all comes to the fans coming to enjoy themselves, grab a ten dollar beer, and maybe a sun burn. For the players it is a major tune up, or a chance of a lifetime to earn a spot on a major league team. As for myself I will keep my dreams alive as I will one day spend some time in sunny Floridato take in some spring time Major League Baseball! I had such high hopes going into last year, I just can't do that to myself again, if the Jays are competitive in August I'll get excited! Think the pre-season's gotta be shorter in every sport, it's one thing to warm up but it's another to waste a month of everyone's time to decide 1 or 2 roster spots. I totally agree with you. Being a baseball fan it's tough to get really interested in spring training due to the length. I don't think I have the answer to the right number of games that should be played, but 31 is too many.